Only shipped October 22nd through April 25th*. A South River exclusive! 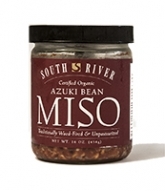 We believe this to be the only miso on earth made with the small red azuki beans, which are highly regarded for their nutritional and healing properties in Oriental medicine. Festive burgundy in color, this delicate miso is ideal for seasoning light soups, bean dishes, sauces, and salad dressings. “Miso is prized for its ability to aid in the digestion and assimilation of other foods. At least four digestive agents are contained in all non-pasteurized miso: natural digestive enzymes, lactic-acid producing bacteria (Lactobacillus and Pediococcus species), salt-resistant yeasts and other microorganisms are present in koji. Only the very hardiest microorganisms are able to survive the rigors of several years’ fermentation in the present of salt. Thus they and their enzymes are well suited to continue their work in the large and small intestines where they break down or digest complex proteins, carbohydrates, and fats into simpler, more easily assimilable molecules. In Japan, commercially available digestive enzymes are often made from the same type of koji used to make miso. * shipping availability dates subject to change depending on weather temperatures as our miso is a live, fermented product and should not be shipped in extreme heat. Deep well water, lightly polished organic brown rice, organic azuki beans, sun-dried sea salt, organic sea vegetables and koji culture. - No gluten or soy ingredients. How long does miso keep? I have had a jar of miso in my refrigerator for about a year. Is it still ok? Opened or unopened, refrigerated or not, miso will keep indefinitely. 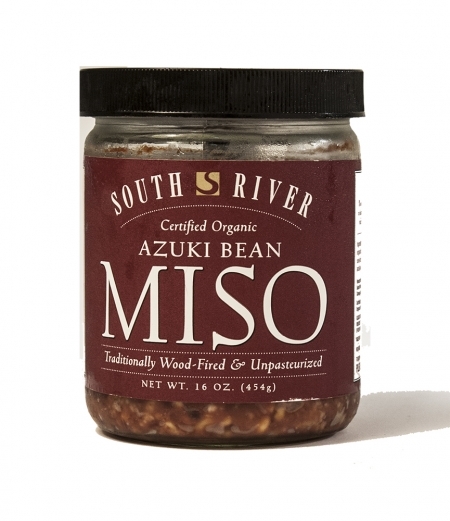 Since South River Miso is a living food, it will continue to age in the jar. Over the course of time, it will darken and become more savory; it is still good to eat. I have heard it is best not to cook miso; if so, how do I make miso soup? Each teaspoon of unpasteurized miso contains millions of active micro organisms which are beneficial to the dynamic digestion and assimilation of all foods, and which help to establish and maintain a healthy, vigorous digestive system. For these reasons, miso should not be subjected to prolonged cooking or high heat. Add miso at the end of cooking and turn the heat source down very low or remove soup from stove and serve several minutes later, allowing the flavors to blend. How much miso should I use? For the greatest benefit miso should be used in small amounts on a regular basis. One to two tablespoons per day would be average use. When seasoning soup, begin by adding a small amount of miso, one to two teaspoons per cup of liquid, adding more if needed. Miso soup should taste neither too salty nor too bland. The miso should mingle with the flavor of the soup and enhance, but not overpower it. These misos are rich-tasting, hearty, slightly chunky and a perfect addition to many meals. Add depth, flavor and nutrition with one of our varieties. Mixed into a cup of hot water, miso makes a simple and fortifying drink, a good substitute for coffee. Use Dandelion Leek or Garlic Red Pepper for an especially satisfying instant broth. Copyright 2009-2017 Holistic Health Reforms, Inc.
** Excluded from Free Shipping: Miracle II soaps other Miracle II products; Silver Water products; Castor Oil; Tonic Supreme; Plant-derived Minerals (liquid); Black Seed oil 8 oz (liquid); Diatomaceous Earth; Organic Sulfur, Celtic Sea salt 1-lb and larger sizes; Maple syrup, Honey or Molasses; Chia seeds; All nut & seed butters, Coconut oil, Olive oil; Tulip Spice Grinder; Ear Candles; Tampico Skin Brush; Master Cleanse Kits, all books larger than pamphlet size, fermentation supplies which contain glass weights (Pickle Pebbles).Free Shipping in the Continental United States only.